Booksellers have always had to contend with warding off book thieves hungry for valuable volumes. 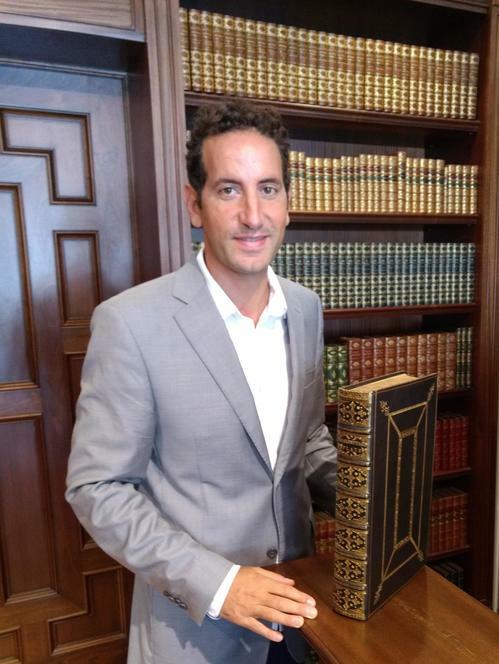 As part of its ongoing efforts to deter book crime, Raptis Rare Books in Palm Beach, Florida, is employing a new piece of technology called synthetic DNA. According to the product’s creator, UK-based SelectaDNA, so-called “synthetic DNA” can help fight inventory loss and theft and has been employed in casinos, hospitals, banks, museums, and other institutions worldwide for over a decade to identify and protect valuables. Earlier this month, Raptis became the first bookseller in the United States to incorporate synthetic DNA for authentication and inventory management. For book collectors worried this serum might mar their treasures, fear not: the non-toxic, water-based serum is invisible to the naked eye. Applied to a book, the serum can last up to five years and has a lifespan of 4 to 6 weeks on skin--helpful to pinpoint a thief who has been inadvertently misted with a special spray, also sold as part of an alarm system by SelectaDNA. The company says their product reduces theft by 83 percent when incorporated into such an alarm system. If triggered by a burglar, the system releases a mist containing a unique DNA code and UV tracer. Shining an ultraviolet light on the suspect will reveal whether he or she purloined the goods in question. Images, from top: Matthew Raptis, owner and founder of Raptis Rare Books, alongside Shakespeare’s Fourth Folio, valued at $100,000. Book marked with synthetic DNA solution without use of ultraviolet light. Book marked with synthetic DNA solution and fluorescing from use of ultraviolet light. Used with permission from SelectaDNA. According to the product's creator, UK-based SelectaDNA, so-called "synthetic DNA" can help fight inventory loss and theft and has been employed in casinos, hospitals, banks, museums, and other institutions worldwide for over a decade to identify and protect valuables. Earlier this month, Raptis became the first bookseller in the United States to incorporate synthetic DNA for authentication and inventory management. "Think of each unit of synthetic DNA as a high-tech fingerprint," explained SelectaDNA vice president Joe Maltese. 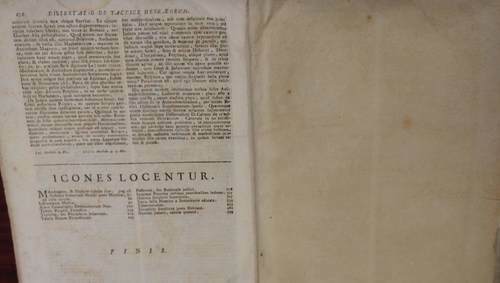 "Each application of Synthetic DNA generates a unique code, providing clients with the ability to identify and recover lost or stolen rare books. Raptis is using the technology to demonstrate their rare books have been authenticated and sold by them." Raptis is using the DNA Asset Marking System which is applied to books with a special stamp; the images below show Raptis is using a stamp in the shape of an "R."
"Raptis Rare Books takes extraordinary measures to ensure authenticity of its collection of literary treasures," said Raptis founder Matthew Raptis. "The use of SelectaDNA is an excellent complement to our rigorous authentication protocols," he continued. "It provides our clients with added confidence in purchasing these rare literary gems." Images, from top: Matthew Raptis, owner and founder of Raptis Rare Books, alongside Shakespeare's Fourth Folio, valued at $100,000. Book marked with synthetic DNA solution without use of ultraviolet light. 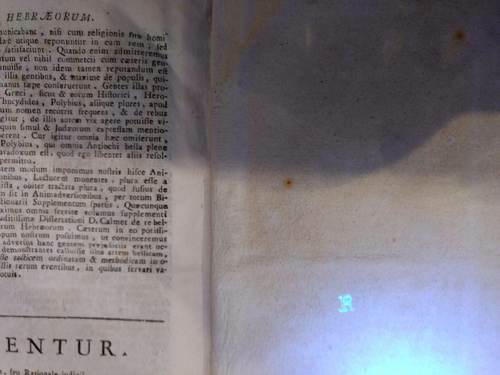 Book marked with synthetic DNA solution and fluorescing from use of ultraviolet light. Used with permission from SelectaDNA.